Ozkan: "from The Ministry To The Presidency"
›Ozkan: "From the Ministry to the Presidency"
Milli Gazete columnist Abdulkadir Özkan writes on Turkey new era. Here is the full article. 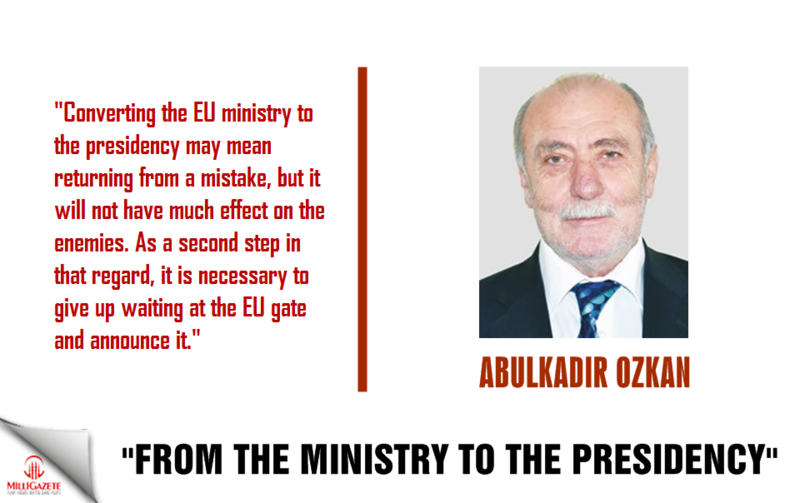 AK Party government in creating the EU Ministers emphasized the importance of Turkey's EU membership. It is supposed that if a ministry to be formed in relation to the EU is to be carried out by hand, our membership will become easier. However, in the intervening during all this time, although classified Turkey as an indispensable EU target of how the EU does not think so. Even distortions of perception of Turkey in the EU countries, will be reduced gradually increasing. Even beyond the distortions of perspective on the EU, Turkey is also offering a complete hostility. For this reason, we have noticed that the various parts of the agenda at least, the EU Ministry should be closed and a clear position should be put on the EU countries, as they continuously show us that they do not want us. With the transition to the presidential system, the important changes such as the attachment of the General Staff Presidency to the Ministry of National Defense in the administrative structure and the Ministry of Foreign Affairs of the EU Ministry were transformed into a presidency were passed. From this point of view, I think that the transformation of the EU Ministry into the chairmanship may mean to say 'Enough is enough' to the EU. However, at every opportunity for the emergence of this discourse is that you have to leave an indispensable destination for Turkey's EU membership. Such an attitude did make a change in the outlook on Turkey by the EU, this change in the direction of what happens if you do, I think we see in a short time. I would like to pay particular attention to a point at this point. EU where there is an intention to get between member Turkey has emerged as the degree of certainty. In this respect, the issue of membership needs to be pushed to one side. Even if they do not get them as a member, they have to give up their hostility towards my country. It seems necessary to take some steps to achieve this. Because the EU countries are extremely hostile to the way in which their stance is described as a friend. In almost every case they apply double standards against my country. When it comes to speech, the EU countries that do not leave democracy, liberty and human rights to anybody, are uncompromisingly promoting human rights and freedoms and democracy. So they show their hypocrisy. In this respect, it is enough to remember the protective and attentive attitude exhibited by members of various terrorist organizations. The EU countries, especially Germany, have become the center of the FETOs wanted after 15 July. There are news in the media that the coup attempt #1, Adil Öksüz, and especially 14 thousand FETÖ protections in Germany. Would it be wrong to characterize this approach as hostility if a member of an organization attempting to strike in this country is embracing the EU countries that we have been struggling to enter into for many years? Because if we really see as their fellow EU countries, then we wait for support from those friendly countries as Turkey is natural. I do not focus on the conservative and reflective attitude of the US to the top managers of the same terrorist organization as it is the main EU member states. We can say that the US and EU countries are no longer friends, and they do not need to hide it. Despite this open hostility, we insist on talking about friends and allies when we open our mouths. However, it should not protect and protect the enemies of friends of friends. If the US and EU countries are supporting the people of the courageous and terrorist organizations by embracing it, if this attitude can not be clearly defined as hostility, what is the measure of the hostility of an country to another country? Converting the EU minister to the presidency may mean returning from a mistake, but it will not have much effect on the hostility exhibits. As a second step in that regard, it is necessary to give up waiting at the EU gate and announce it.